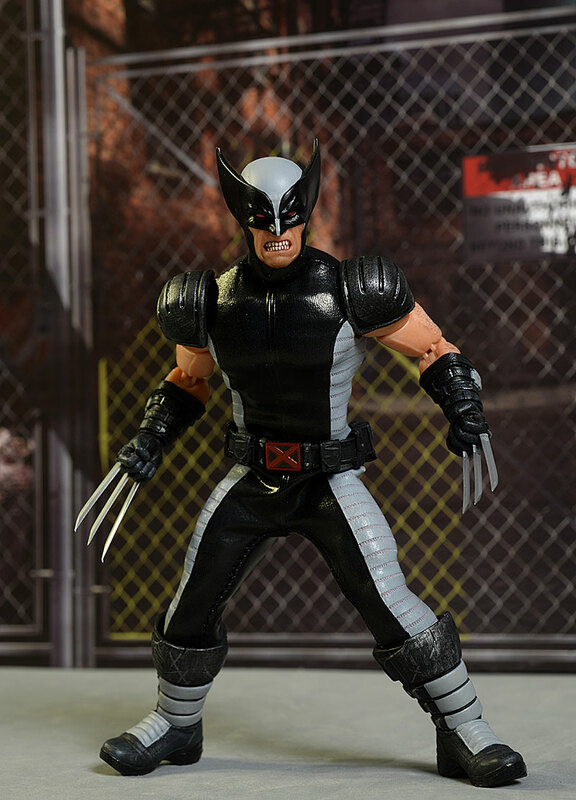 When Mezco does a popular character, they ensure they've done enough variations to make everyone happy and then some. The more popular, the more variations. 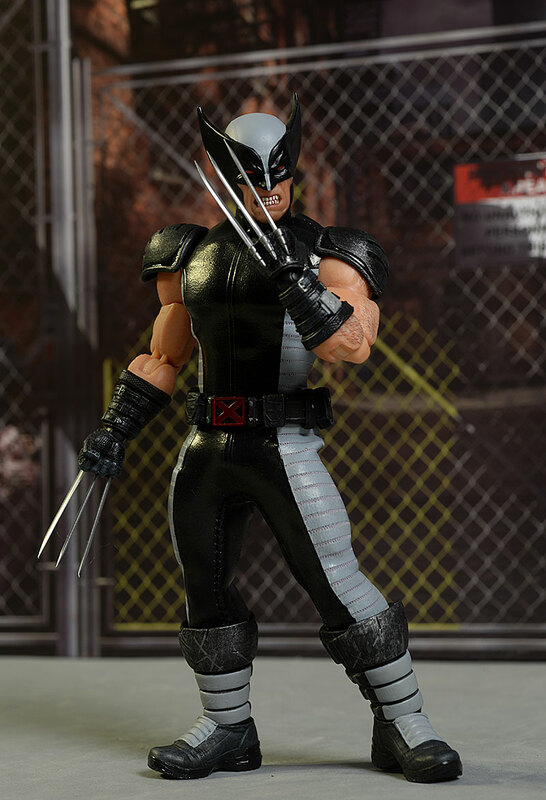 And with a character like Wolverine, you know you're going to get plenty of variations. They did the regular yellow/brown suit of course, and they did the special 'tiger stripes' NYCC version last fall. 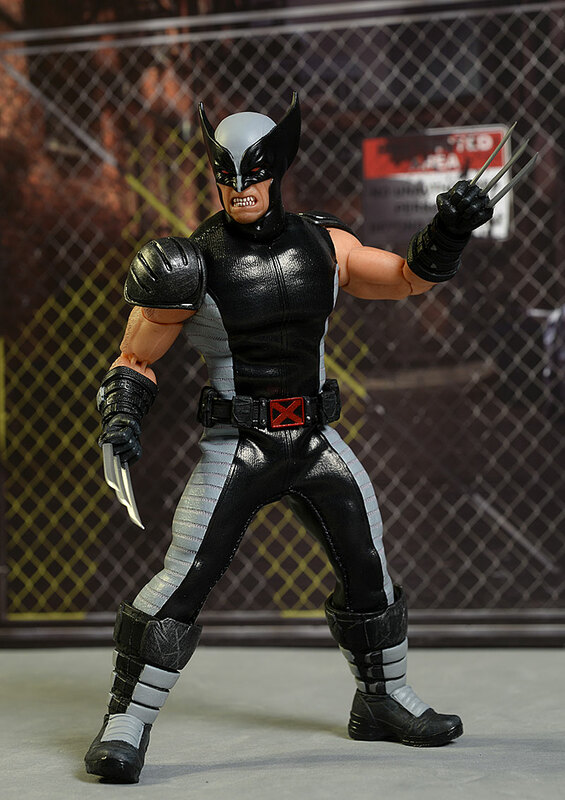 The next in line just started to ship - the PX (or Previews) exclusive version in the black and gray costume. 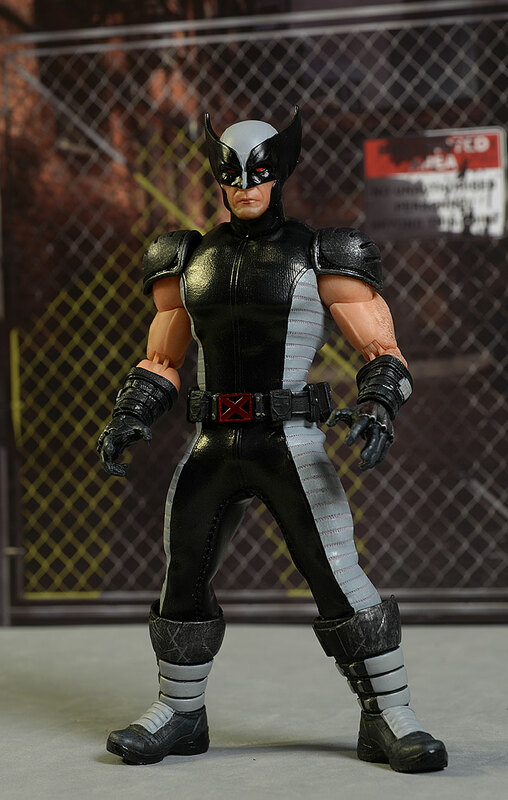 You can still find this guy at some online retailers, which is surprising for an exclusive One:12 figure. I don't expect him to last much longer though, particularly once people start seeing him in hand. He'll run you around $80, at least for now. This is another of the 'tin can' exclusives, and I really love these packages. The large, all metal container has a hinged lid, and is made from very high quality material. This is one of those very rare cases where you can put the figure on the shelf, the accessories in the included baggy, toss the plastic trays, and still find a million cool uses for the package itself. 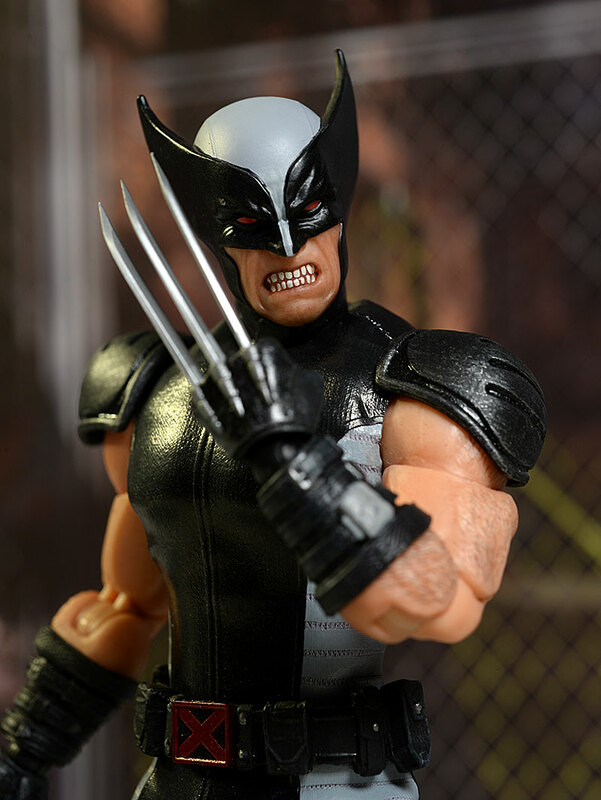 If you have either or both of the previous One:12 Wolverine releases, then you have these two head sculpts. One is stern, one is crazy. One looks like he's pondering the act of gutting you, the other looks like he is gutting you. The heads swap easily, and you have plenty of posing options with either. I'm not much of a fan of the less extreme, and the paint work (more on that in a minute) re-enforces that opinion. But the gritted teeth, snarling head sculpt will work just fine for the majority of the poses I plan on using. 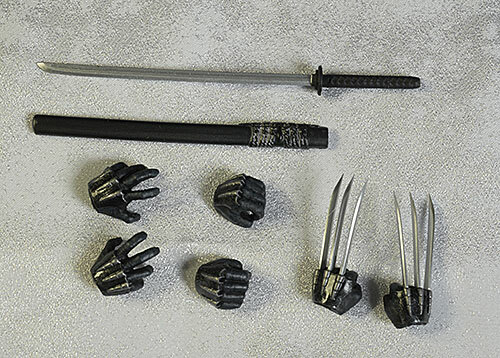 The hands are sculpted to work with the accessories, and one set has the sculpted plastic blades. Be particularly careful popping these on to avoid putting any pressure of any kind on the blades themselves. The sculpted costume bits look great, especially the belt. It rides where it should on his hips, and the subtle textures on the various pouches is pretty impressive considering the scale. The boots, gloves, and shoulder armor look good as well, although there isn't a ton of texture work this time. He's a little shorter and stockier than other figures in the One:12 line. While most of them are around 6 1/2" tall, he comes in at 6" without the ears. The paint work is a little rough this time - at least by One:12 standards. Remember, this guy is only 6" tall, so those huge heads you're seeing in the macro photos are indeed much, much smaller in hand. I recommend using the LifeSizer feature a few photos up to get a better understanding of scale. Mezco has set the bar pretty high for themselves and others in this scale. The edges on the mask, particularly between the black and gray, aren't as clean and neat this time. These wavy edges exist on both portraits. The red X on his belt buckle is fuzzy as well, something you don't normally see from them. The work on the angry lower face is good, particularly around the teeth and lips. The slightly translucent skin gives the face depth and realism, and is something you normally only see with high end sixth scale figures. But the lower face on the stern portrait is less impressive. It's those lips, man. I'm not sure what's up with the lipstick, but it's not a good color for him. He's more of an autumn. The overall base body has all the joints you expect, and most work quite well. 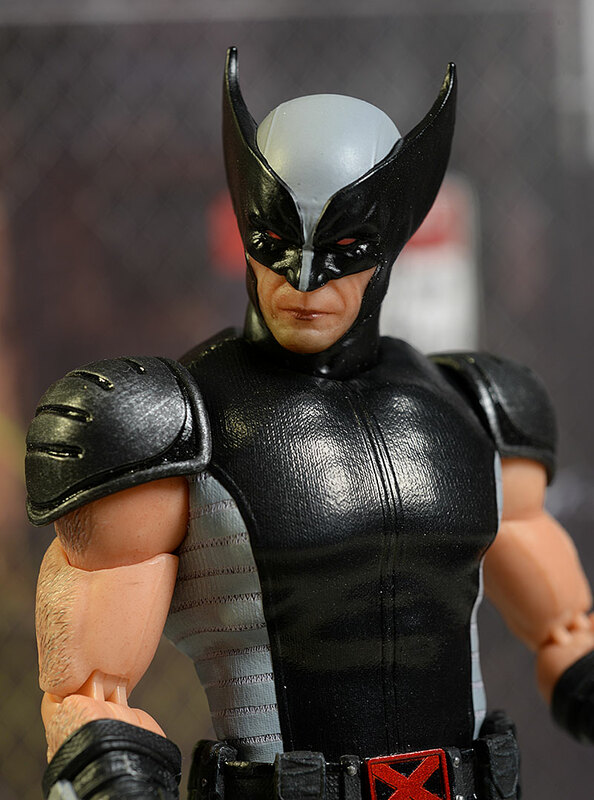 I think the neck actually works a bit better here than it did with the regular release Wolverine. There's no good reason for that, and it may simply be a manufacturing variation figure to figure. In any event, I was able to get good tilt and lean action out of both the top and bottom of the neck joint, and the heads swapped easily and cleanly. With less costume restricting the shoulders, elbows, and wrists, you can get plenty of good arm poses. The wrists are an issue though, because while it was pretty easy to swap hands, they tend to pop off when posing and handling the figure. The tight leather-like costume is more restrictive than the spandex style suit. The torso has the ability to lean, tilt, and crunch, but the suit tends to force it back to center. The hips can't get quite as wide, since the pleather crotch is so tight, and there's less rocker movement in the ankles with this boot design. It's not a terrible situation, but there is less mobility in this costume than in the regular release. If you bought the regular, you also got all these same accessories. He comes with eight hands in total - the fists he comes wearing, plus a tight grip set, a wide grip set, and a set of fists complete with blades. As I mentioned earlier, they swap easily, but tend to pop off when you're handling the figure. There's also a sword and scabbard, identical in sculpt to the original release but with an updated paint job. I already mentioned the two portraits, a big plus for the One:12 series overall. And of course, there's the standard One:12 black base that can be used with a simple foot peg or the more complex clear plastic support, perfect for jumping and leaping poses. The quality of the outfit is top notch, with no issues around the stitching, tailoring, or fit. The shape around the crotch is a little wonky, but it's very minor, and there is thankfully no saggy appearance in the area. I like this costume better - as a costume - than the previous spandex/shorts outfits. 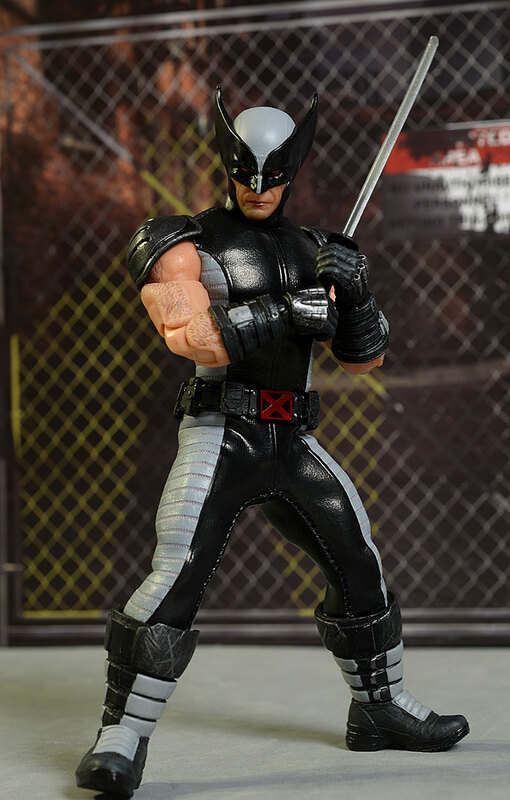 I know it's not as iconic for Wolverine, but this design is more modern age heroic. Of course, your mileage will most certainly vary. While there isn't a ton of accessories or perfect articulation, there's enough here to give you plenty of fun posing and displaying this figure. He's generally sturdy enough for kids too, although you'll want them to take some care with the bladed hands. The various exclusives will run you $80, and this guy is right in line with that price point. However, unlike the recent PX exclusive Deadshot, there's not a lot of extras here, making it a little tougher to justify the cost. On the upside, you are getting a different costume, and not simply a different color. I mentioned the blades on the hands earlier. When you're popping the hands on or off, you should take care not to squeeze or push on the blades. The thin plastic would be easy enough to damage. 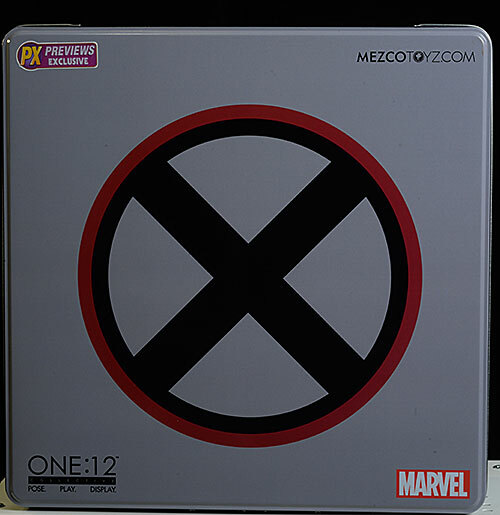 While this isn't quite as nice as the best One:12 has to offer, it's a decent release of a popular character. Better paint and a couple more accessories would have gone a long way to making the score a bit higher, but if you're a big One:12 fan, you won't be disappointed with your purchase. - has him in stock and ready to ship for $80. - still has him available at $80. 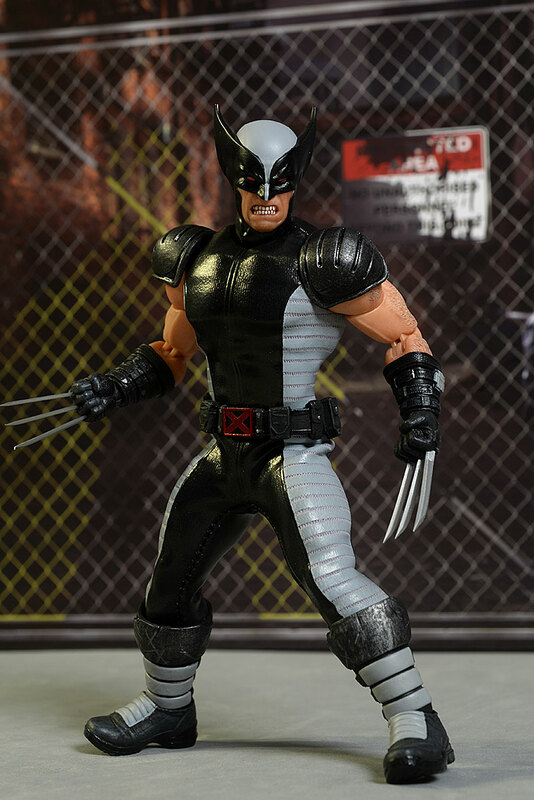 - Entertainment Earth has him in stock, AND they have free shipping! I've reviewed LOTS of One:12 figures, including the PX exclusive Deathstroke, Knightmare Batman, the Toy Fair Ascending Knight Batman, and the regular Spider-Man. 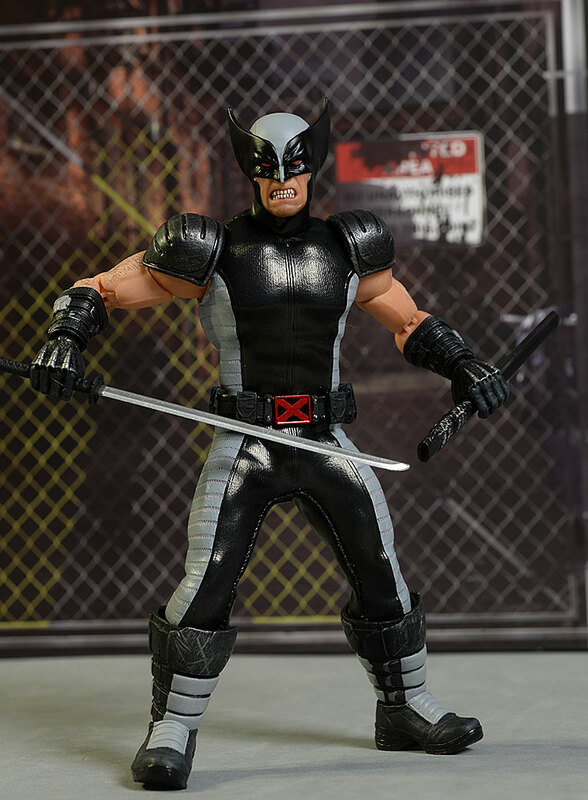 Earlier figures include the PX Exclusive Deadpool, the Mezco exclusive Deadpool, the One:12 X-Men Deadpool that was a 'summer' exclusive, as well as the recent Deathstroke, Suicide Squad Harley, the regular Red Skull, classic Superman, and the Morales Spider-Man. I've also covered the the exceptional classic Punisher, the regular release Punisher the Toy Fair exclusive version, Shazam, the classic Daredevil, the Flash and Reverse Flash, the BvS Superman, the comic based Joker, Green Arrow, the Frankenstein Monster Diorama, Frankenstein Monster, the BvS Batman, the Bvs Armored Batman, Captain America, Star Trek Kirk, the Mirror, Mirror and Cage variants of Spock, Sulu, the Toy Fair exclusive Spock, and the regular release Spock as well. Other One:12 Collective figures released so far include Dredd and his Lawmaster, the NYCC exclusive Judge Dredd, the DKR Batman and Mutant two pack, the Batman exclusives, and the initial DKR Batman.